If you come home from work and have a couple of glasses of wine, or, better yet, enjoy them with dinner each night, the news is good. Most likely you are extending your life and helping your body avoid a number of diseases. Pairing those glasses of wine with a Mediterranean diet that emphasizes fruits, vegetables and whole grains with healthy servings of fish and dairy, and limited amounts of meats and sweets, is so much the better. While certain groups of people should avoid wine completely, for most it can be part of a healthy lifestyle. Even a small amount of alcohol will have some impact on the body. The amount of alcohol in the human system is measured by the blood alcohol content, or BAC, percentage. The less weight, the higher the BAC will be from even a small amount of alcohol. Two glasses of wine, each no more than 4 or 5 oz., may make you more relaxed and talkative but also slightly less coordinated and less able to concentrate. How quickly alcohol is consumed also affects BAC, so it's better to sip slowly during the course of a meal or while relaxing during the evening. According to "Bandolier," a British journal that focuses on evidence-based health care, consumption of beer and wine reduced the risk of death from coronary heart disease. For those who drink wine, having between one and seven drinks per week reduced the risk by 26 percent; having between eight and 21 drinks per week reduced the risk by 36 percent. Studies of what is known as the "French Paradox" reveal that even for people in southern France whose diets are high in fatty, high cholesterol foods, the regular, moderate consumption of wine is linked with low rates of heart disease. Chemical components in wine called polyphenals, including resveratrol and quercetin, are antioxidants that may help protect the body's cells against damage, according to the National Cancer Institute. Many of the studies are in laboratory cultures or animals, but resveratrol has been shown to inhibit the formation of tumors and to reduce inflammation, which helps prevent cancer. Furthermore, a study at the Yale School of Public Health showed that women with non-Hodgkin's lymphoma who were moderate drinkers of wine had lower rates of relapse and death in the eight to 12 years during which the study followed them than women who did not drink wine. 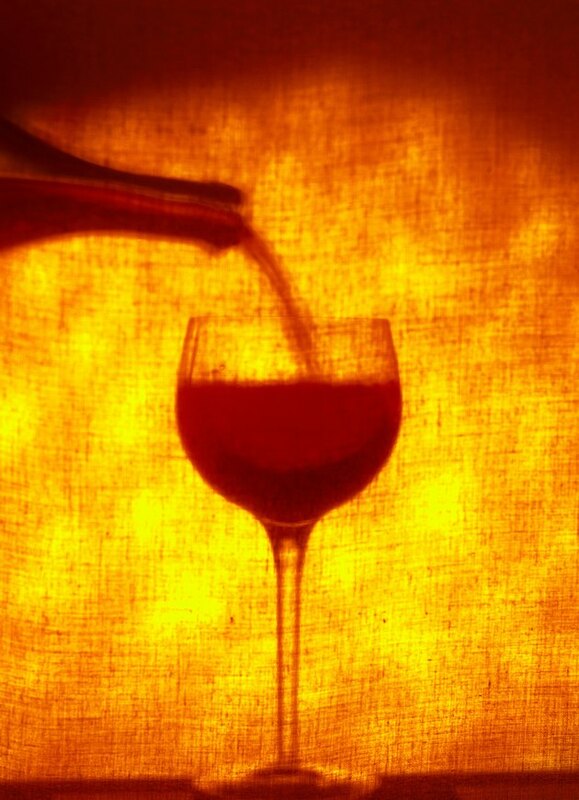 "Bandolier" reports that light to moderate wine consumption reduced the risk of cancer mortality by 14 to 22 percent. Drinking moderate amounts of wine also may help prevent peptic ulcers, gallstones, diabetes, strokes, dementia, Huntington's disease and Parkinson's disease. More research is needed to define the links between wine consumption and lowered rates of various diseases and to see if other sources for the same chemicals exist. Exercise caution with any alcohol consumption. Doctors advise against beginning to drink if you don't already do so. Alcohol carries with it the risk of overindulgence, with many negative effects. Moderate consumption is defined as one small glass of wine daily for women and one or two for men. Do not drink if you are planning to operate a motor vehicle. Alcoholics, pregnant women, adolescents and those suffering from certain medical conditions, including peptic ulcers, liver or kidney disease, depression, and epilepsy, should avoid alcohol completely. Do not drink if you are taking certain over-the-counter or prescription medications, and avoid alcohol if you are a pre-menopausal woman with a family history of breast cancer. If you have any doubts about whether it's safe for to consume wine, ask a physician. Does Drinking Alcohol Slow Your Metabolism? How Many Calories Are in Chardonnay Wine?